Radio-Craft magazine founder, editor, and publisher Hugo Gernsback wrote this piece in the Fall after the United States officially entered into World War II. I say officially because to some extent we were participating for many months prior to the Japanese attack at Pearl Harbor on December 7, 1941. Recall how FDR justified his March 1941 Lend Lease program by comparing the action to lending your hose to a neighbor whose house was burning. We were providing equipment and training to Allied nations in Europe almost immediately after Hitler's army invaded Czechoslovakia in 1939. The Army Air Corps had the famous Flying Tigers squadron defending southern China against Japanese bombing attacks as early as April of 1941. Electronics communications, which made great advancements during WWII, played a major role in the ultimate Allied victory. When the final chapter of the present war is written, future , historians will chronicle with satisfaction the fact that one of the vital industries responsible for winning the war was unquestionably the American Radio Industry. Changing almost overnight from a peace-time to a war-time basis, the U. S. Radio Industry has performed one of those war-time miracles which are typical of American enterprise. When late in 1941 radio manufacturers were told that they had to change their entire set-up to an all-out war effort, little comment was made, but there was much thinking and planning. While these lines are written, the American Radio Industry has gone over the top with flying colors. Unlike other industries, there have been practically no strikes whatsoever and the War Department has experienced little or no bottlenecks, so far as radio materiel is concerned. In times of peace, the entire radio industry had a turnover of over one billion dollars annually. What the turnover will be for the first war year cannot be divulged now, for military reasons, but the output is huge - unbelievingly so. As the writer has stated editorially for many years, long before anyone thought about this war - radio in all its complex phases in modern war is just as important as airplanes, tanks and guns. Indeed, none of these could be operated efficiently without radio nowadays. Modern warfare makes terrific demands upon radio, and new refinements and new inventions are a daily routine today. 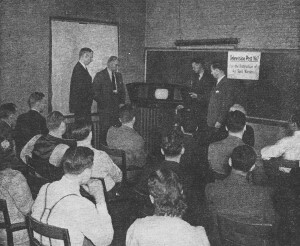 The layman, and indeed, most of our radio readers, would be astonished to know all the important new radio inventions which have recently been made, many of them already in use to further our war effort. There is no question whatsoever that when victory finally has been achieved, radio will be voted a high place in the list of war machines that made victory possible. The U. S. Radio Industry found out almost immediately at the start of their conversion program, that it is one thing to manufacture radio receivers for peace-time purposes, but quite another to manufacture radio materiel for war uses. The two bear little relation to each other. Thus, for instance, in peace-time, radio receivers were not normally manufactured to work efficiently in humid tropics of over 100 degrees and in temperatures of 40 degrees below zero; but that is exactly what the requirements are for war-time radio sets. They must be made in such a manner that they can stand almost submersion in water, the most humid hot temperatures, or the most vicious cold. Our troops fight in every corner of the world and very frequently they have to be where temperatures are both abnormally high or low. Thus, in Egypt for instance, the daytime temperature is often 100 degrees and over, and the nights frequently are near freezing - -depending upon the season of the year. On top of this, sandstorms are encountered which would play havoc with an ordinary radio set not built for such wear and tear. Then we have tank radios and airplane radios, all of which are subject to severe mechanical shocks. That again means a radical departure from a peace-time radio set. Indeed, military radio communication receivers bear little resemblance to a peace-time radio. The entire construction varies, as the set simply must not fail to operate under almost any given condition. Ordinary materials just will not stand up under these unusual conditions. For this reason, the engineering on all combat radio receivers is a difficult undertaking in itself. Not only that, but the raw materials which now go into radio receivers must also be different f rom those used before Pearl Harbor. Substitutions must be made not only for the most unusual conditions, but the engineer today also must think of rubber, tin, copper and other shortage items, and this is a heroic task all by itself. Fortunately, the American Radio Industry has risen to the occasion and has gone over the top with - flying colors. While not all problems have been solved, by any means, it may be said that all the important production problems have been met satisfactorily, and we also know that with few exceptions, all American radio materiel has stood up excellently under the most aggravating conditions possible. Under adverse conditions, coupled with war-time pressure, the American Radio Industry has taken every obstacle in its stride, and it has grown amazingly in the process. Astonishingly much new radio gear is being turned out day and night, holidays included, - much of it so secret that even the workmen who are constructing it do not know what it is all about. There are many radio surprises for the enemy and still more are in the making. 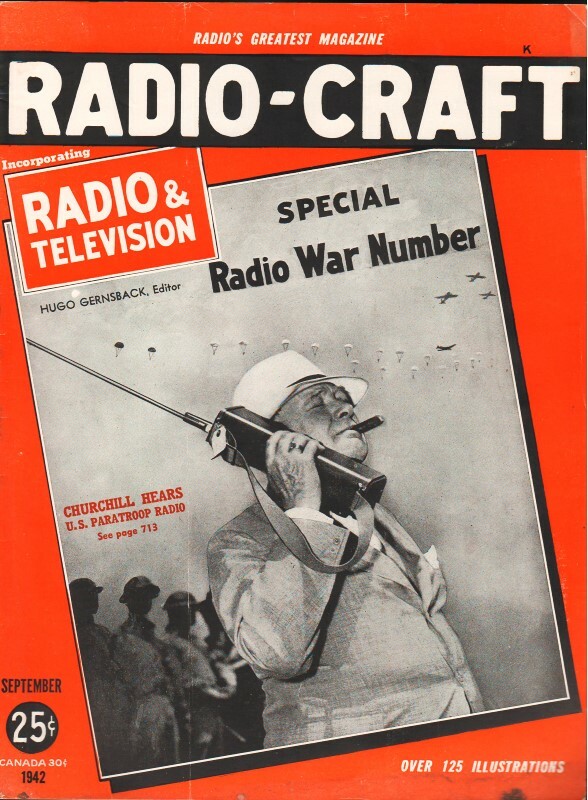 Several issues of this magazine could be filled with all of the new radio accomplishments, and once the war is won, the pages of Radio-Craft will bristle with U. S. Radio War Inventions - which we guarantee will take your breath away - and at the same time will fill one of the glorious chapters of American inventiveness, patriotism and endeavor.